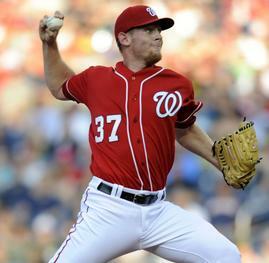 Washington Nationals rookie Stephen Strasburg has burst onto the major league scene with three strong performances. Several writers have capably covered what we’ve learned from the PITCHf/x system about Strasburg in those games: Nick Steiner, Colin Wyers (subscription required), J-Doug, and Jeremy Greenhouse. In addition, we have PITCHf/x data from two of Strasburg’s games in the Arizona Fall League last year, as covered by Harry Pavlidis. Suffice it to say I’m not breaking new ground when I write about Stephen Strasburg and PITCHf/x, but I thought it would be interesting to combine the data from all five starts covered by PITCHf/x to see what we can learn about Strasburg’s approach from a larger data set. Strasburg throws four pitches: a four-seam fastball, a two-seam* fastball, a change-up and a curveball. Here are the pitch speeds and spin axis of the pitches he has thrown. His four-seam fastball sits in the upper 90s and touches 100 mph for an average speed of 98 mph. The average spin deflection on this pitch is eight inches of hop and six inches of tail. It’s his main pitch to both right-handed batters (45 percent of the time) and left-handed batters (39 percent of the time). His two-seam fastball also sits in the upper 90s, with an average speed of 97 mph. It has some nice sink for a pitch thrown that hard, with an average spin deflection of four inches of hop and nine inches of tail. It’s not unusual for a pitcher to throw a two-seam fastball at the same speed or nearly the same speed as his four-seam fastball. What’s unusual for a starting pitcher, obviously, is that he throws his fastball so fast. Strasburg uses the two-seamer most often to left-handed batters (27 percent of the time) and less frequently to right-handed batters (11 percent of the time). *He has an interesting grip on this pitch, with his index and middle finger along one seam instead of each finger along a different seam. It’s very similar to the grip that Jon Lester uses. In the interests of clarity, I’m going to call this pitch a two-seam fastball, but others, including Strasburg himself, have labeled this pitch a one-seam fastball (based on the grip). His circle change-up comes in around 90 mph and has good drop. This pitch has an average vertical spin deflection near zero and eight inches of tail. He uses the change-up 13 percent of the time to right-handed batters and 20 percent of the time to left-handed batters. Like all his other pitches, Strasburg’s curveball is thrown hard, averaging 83 mph. Despite throwing this pitch as hard as many pitchers’ sliders, he gets good break on it, with eight inches of drop due to spin and seven inches of horizontal movement. When adding in the effect of gravity, this results in a pitch that drops 2.5 feet over the last 40 feet of travel. Strasburg prefers the curve against right-handed batters (31 percent of the time) much more than against left-handed batters (14 percent of the time). Some have called Strasburg’s breaking pitch a slider or slurve. It’s not. I think they may have been deceived by the velocity on the pitch. A classic slurve is more like the sweeping breaking pitch thrown by Francisco Rodriguez or Carlos Marmol, about 10 mph slower than the fastball and with mostly horizontal spin deflection and little vertical spin deflection. An average starting pitcher throws fastballs around 90 mph, sliders in the low to mid 80-mph range, and curveballs in the high 70-mph range. Strasburg is not an average pitcher. At 83 mph, his curveball is 15 mph slower than his fastball. That’s solidly in curveball territory. Moreover, the large negative vertical spin deflection on the pitch and the grip he uses are both classic curveball. 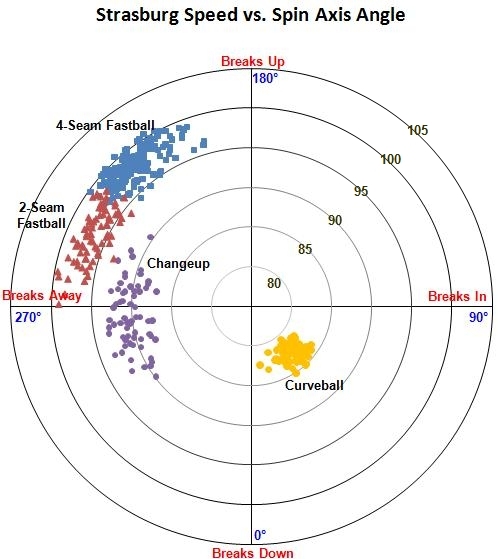 Strasburg likes to start off right handers with a four-seam fastball or a curveball, and if he gets Strike 1, he really likes to go the curveball, throwing it two-thirds of the time at 0-1. He brings out the change-up as his strikeout pitch, though he will also throw it at 1-0 or 1-1. When he gets behind in the count, he relies on his four-seamer, as do most pitchers. Strasburg starts left handers with four-seam fastballs, two-seam fastballs and an occasional change-up. Whereas to right-handed batters, he uses the curveball early in the count, to lefties he’s more likely to use it when he gets ahead in the count. His change-up, on the other hand, does not really get used as a strikeout pitch to left-handed batters; instead he tends to throw it as the second or third pitch in the at-bat. 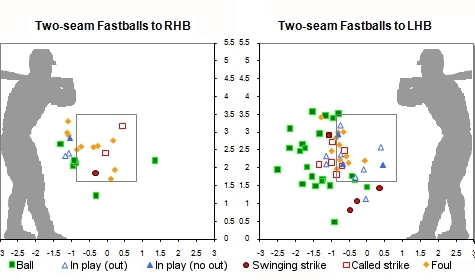 With two strikes, left handers are fairly like to see a four-seam fastball from Strasburg (53 percent four-seamers vs. 8 percent two-seamers), but earlier in the count the two-seam fastball is just as likely (35 percent four-seamers vs. 33 percent two-seamers). 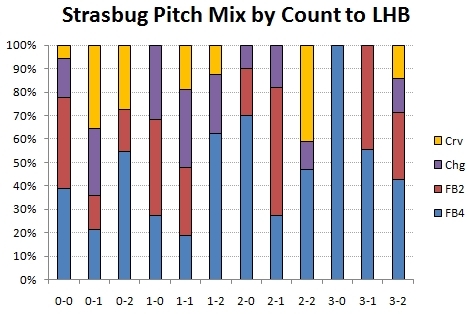 What kind of results does Strasbrug get with each of his pitches? The first thing to notice is that he throws all his pitches for strikes, including his off-speed pitches. League average is 60 percent strikes on change-ups and 57 percent strikes on curveballs, but Strasburg gets 62 percent and 67 percent. He’s league average with his fastball at 63 percent strikes. 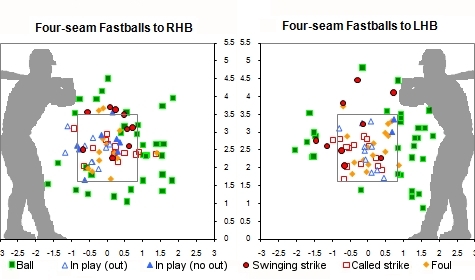 The second thing to notice is that batters have a lot of trouble making contact with his off-speed pitches. An amazing 37 percent of his change-ups and 21 percent of his curveballs result in swings and misses, more than twice the league average of 15 percent and 10 percent, respectively. By way of additional comparison, Tim Lincecum gets about 25-30 percent whiffs on his change-up and Adam Wainwright gets about 15 percent whiffs on his curveball, in much larger data sets, of course. It probably comes as no surprise that his 98-mph four-seam fastball generates 11 percent whiffs, compared to league average of 7 percent. His two-seam fastball is more in line with league average in that department, but it produces a lot of foul balls. Batters have had pretty good results against his off-speed pitches when they’ve put them in play, but that hasn’t been often: 4-for-7 with one home run off the change-up and 4-for-7 with two home runs off the curveball. His two-seamer, on the other hand, has generated nine groundball outs and one bunt out against two line-drive singles. Strasburg seems willing to challenge hitters in the zone with his four-seam fastball. He gets the most swings and misses when he gets the ball up, and left handers have swung at some fastballs at shoulder level. To right handers he does OK bringing the heat inside, but to left handers he does better keeping the four-seam fastball away. He uses his two-seam fastball sparingly to right-handed batters, but when he does, he likes to keep it on the inside part of the plate where it’s tailing in on the batter’s hands. Similarly, he keeps the pitch away from left-handed batters, where it tails off the plate and away from the sweet spot on the bat. When he has dropped it below the zone to lefties on occasion, they’ve not done well, with three whiffs and a groundball out. Strasburg keeps his change-up down. Down and in to right handers, down and away to left handers. Down. And the batters can’t lay off of it, whiffing like crazy. I assume he must have pretty good deception. If the batters could only lay off his change-up, they’d be much better off. Of course, if it were that easy to lay off good diving change-ups, Lincecum wouldn’t have two Cy Young Awards. On the other hand, on the rare occasions when Strasburg has left his change-up up in the zone, the batters have gotten a few hits off of it. Strasburg uses his curveball often to right-handed batters, and he gets a lot of called strikes in the zone. Below the zone he gets a fair amount of swings and misses. 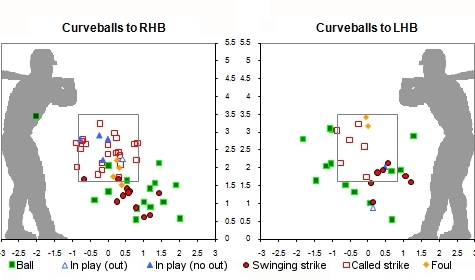 There has been some concern that Strasburg is getting a smaller strike zone from the umpires because of the unusual, and thus difficult to call, nature of his curveball. In truth, there’s not much evidence of that. In the chart above you can see there is one ball that clearly should have been a called strike and a few very borderline ball calls that probably wouldn’t have been called strikes for another pitcher’s curveball, either. Granted, these charts show the location of the pitch at the front plane of the plate, but a typical curveball from Strasburg only drops about an inch while traveling 8.5 inches toward the catcher, so that doesn’t change the picture by very much. How Strasburg pitches with runners on base has been a topic of conversation. 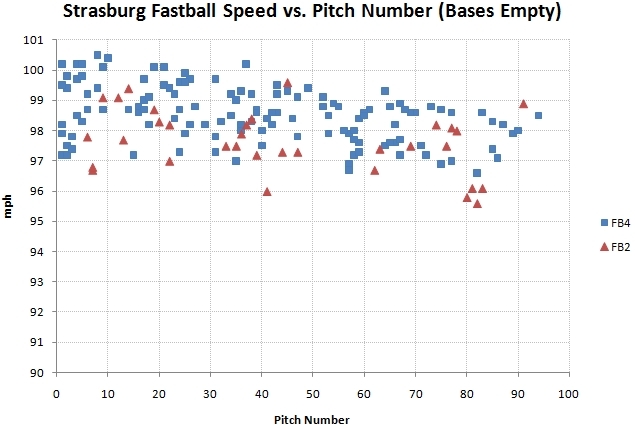 After Strasburg’s start in Cleveland, Bob Feller observed, “He loses about two or three miles per hour on his fastball with men on base.” I looked at the data for that from the game in Cleveland and found that there might be substance to Feller’s comments. However, this time around I wanted to look at the data for all five PITCHf/x starts instead of just one. It turns out that Strasburg loses almost two mph on both his four-seam and two-seam fastball when runners are on base. I also looked for changes in spin deflection on his pitches with runners on base, but I didn’t notice any significant changes in that arena. In addition, we can see how his pitch mix changes with runners on base. With the bases empty, he favors the four-seamer over the two-seamer to lefties and uses the four-seamer almost exclusively to righties. When runners get on base, he abandons the curveball to lefties but sticks with it to right-handed hitters. He’s also somewhat more likely to use the change-up with runners on base. One thing I wanted to check, though, regarding the change in fastball speed, was whether the baserunners mostly occurred in the later innings when Strasburg was already losing velocity. In the Cleveland start, there was some indication that the two effects might be overlapping. In the larger data set, however, there isn’t as much indication of this. 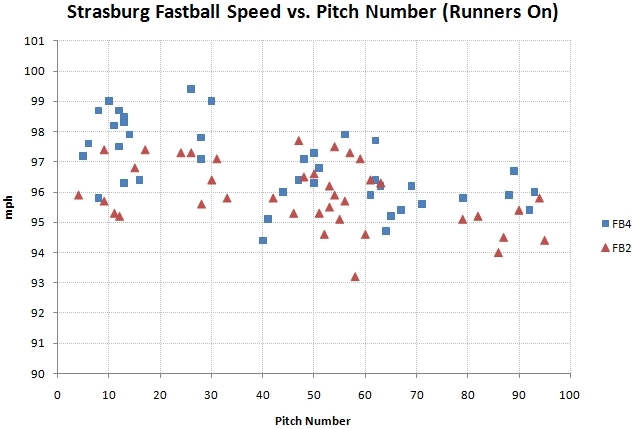 Here we can see Strasburg’s fastball velocity by pitch number, for both the four-seamer and two-seamer. A few things stand out. First is that he loses one or two mph from pitch No. 10 to pitch No. 90. Second is that his velocity is lower with baserunners no matter how deep in the game. Thirdly, as we saw in the preceding table, he favors the four-seamer with the bases empty and the two-seamer with runners on, presumably in hopes of a getting a groundball double play. 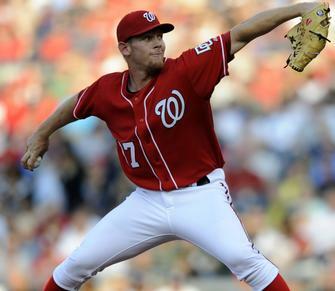 Stephen Strasburg is a pitcher with amazing stuff and few apparent weaknesses. He throws four pitches for strikes with good movement and well-above-average velocity. As a rookie he presumably has much yet to learn about the art of pitching, knowing which pitch to throw when and how to read which way a batter is leaning. What he’ll be able to do if he learns those things and keeps his phenomenal stuff, I can only imagine. Thanks to Sportvision and MLB Advanced Media for the PITCHf/x data. Pitch classifications used in the article are my own. I wonder how much of his pitch selection is dictated by Pudge Rodriguez. I’ll have to watch to see if he shakes him off in his next start but I’m guessing it won’t be very often. Thanks for the shout-out, Mike. Great work. Oh, what I mean to ask… What tool do you use to produce polar plots? Thanks, J-Doug. I made all the charts in Excel. Making the polar plot required a bit of extra effort since Excel doesn’t come with a polar plot. It’s really just an x-y scatter plot with the points converted to polar coordinates and each ring created as an extra series of points connected with a smoothed line. I got that idea from Tango. 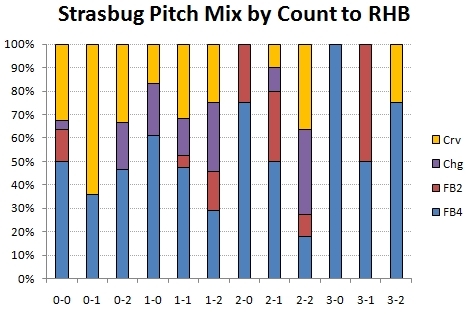 I think there is a little typo in the pitch mixes to RHBs vs LHBs. They do not add up to 100 unless I switch one of the values around. I am assuming that the reported fastball values are correct and that he throws off-speed (by his standards…) 50% of the time to LHBs and only 30% of the time to RHBs… is that correct? Awesome work. I really like the polar diagram, which I don’t think I’ve ever seen before. One small improvement I would suggest is replace “breaks in” and “breaks out” with “armside” and “gloveside” or something along those lines, as Strasberg has to throw to lefties too. Yves, I’m not sure exactly what you are referring to. Are you talking about his overall pitch mix to RHB and LHB? I think what I wrote adds to 100 percent for each. Thanks, Jake. That’s a good suggestion. I really wanted to say “breaks left” and “breaks right” but of course that’s completely unclear unless you know whose right/left. I thought about putting “breaks in to RHB” and “breaks away from RHB” but that starts to get really cluttered. Your suggestion might be the best solution. This is awesome analysis, Mike. That whiff rate on the changeup is other-worldly. Actually, the curveball too, for that matter. You’re right Mike. I got crossed up by something so simple as you mentioning LHBs first for the 2-seamer. I definitely need some rest. Btw, you could look into using R (a statistical computing package) for making graphics. It is much easier and cleaner than Excel, makes higher quality graphics, is free, and can run on any platform. It’s pretty easy to script in also, and has extensive help manuals and forums. I use R for a few things, but I much prefer the better quality of graphs I get out of Excel and the much easier usability. To each his own, I guess, but I haven’t seen anyone producing graphs of this quality out of R.
Cool stuff. Strasburg’s only limitations are those imposed by human physiology and anatomy. No one knows how his right arm will hold up under all that stress, and his mechanics are problematic. But we are witnessing something special while it lasts. Something I’d like to see: who gets the most movement on their fastballs at the various speeds (like 88-90, 91-93, 94-96, 97+). The chart is showing how a bal moves differently from a hypothetical pitch of the same velocity but without spin deflection (i.e. the balistic trajectory from high school physics). 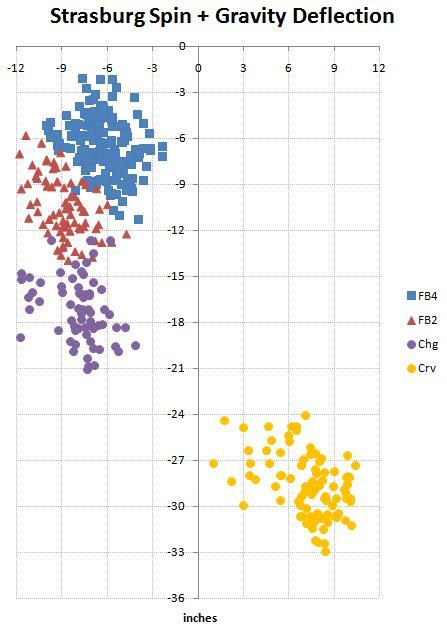 This is how 95% of pitch fx data is presented, as it is the most useful way to illustrate the movement on a pitcher’s pitches. Ryan, a spinning baseball experiences three forces: gravity, drag, and spin (the Magnus force). The first graph shows the effect of the spin force only. The second graph adds gravity to the picture. You can see that when gravity is added, all the pitches drop. However, the Mythbusters quote is not accurate. PITCHf/x has shown us that a number of pitchers can get almost as much upward spin force on the baseball as the baseball’s weight, certainly more than half. It’s true, I shouldn’t have said, “Strasburg likes to start off right handers with a four-seam fastball or a curveball.” I should have said, “Strasburg often starts off right handers with a four-seam fastball or a curveball.” I have no idea what he likes or doesn’t like about the game of baseball. I mentioned elsewhere when I wrote about Strasburg, but didn’t here, that I’m sure he’s depending on Pudge’s experience. 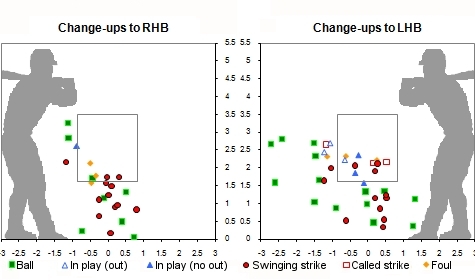 I cannot understand why RHP do not throw more curves and sliders to LHB, and vice versa. In effect it is like throwing a screwball to a hitter, a much harder pitch to gauge than the more familiar curve ball breaking away from a hitter, when the pitcher and the batter are R-R or L-L. I see Strasburg throws a few curves to LHB, but not many. Hard to believe many LHB could touch this pitch, from Strasburg. I’m not buying the mythbusters explanation of why a baseball can’t rise. While I’m sure they’re right that actual baseballs don’t break up, whiffle balls definitely do (http://www.youtube.com/watch?v=1ZPPMIY0Yd4&feature=related). The effect is obviously the result of drag, and I see no reason *in principle* why a baseball could not generate such drag. My guess is that they’re relying on (false,but approxiate) assumptions about the symmetry of baseballs and (true) assumption about how hard pitchers throw, which will make it the case that the actual deviations from the false assumption are very, very small.